Protein X Junior! Is it perfect for your Kid? Growing up is not Kid's play anymore! Children in their early years need proper nutrition for good physical growth and mental development. In today's busy world, it is a big challenge for parents to make their kids eat healthy. And, they definitely look for an alternative like a supplement or a health drink to meet the nutritional requirements. With so many popular brands and their attractive commercial ads, it is obvious for parents to get perplexed about the right product to choose. 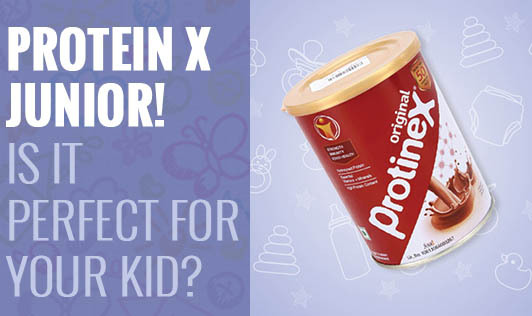 So I picked up a health drink to review ProteinX Junior which is available in two yummy flavors of vanilla and chocolate. It is a product by Wockhardt nutrition. The target group of this product is kids of age group between 4years to 6 years. The serving size recommended is 45grams a day (which is 3 tablespoons). A 400gram tin is priced at Rs 374 which is comparatively expensive to other brands like Junior Horlicks or Complan. • Superior combination of whey, milk and soy protein for optimal physical growth. • 34 essential vital minerals and nutrients. • FOS which is known to promote healthy bacteria and increase immunity. I did a comparison between two other leading brands (Complan and Junior Horlicks) and came to a conclusion that it has a comparatively higher protein, calcium, vitamin A, vitamin C, and DHA content than these brands and this makes it worth the cost. However, a serving size of 45grams with milk is not practical enough to give in one go. It can probably be split up twice a day along with milk. This also ensures an intake of two glasses of milk a day! Though any health drink for that matter will not suffice the nutrition requirements of your kid, it only takes care of a part of the overall daily requirement. As the name suggests it is a supplement and not a complete food. It is only to assist and boost up the nutrition for picky and fussy eaters. Do not depend on these health drinks for your kid's complete health. You still have to work on and encourage your child to eat healthy food. In fact, if you as a parent tries to improve your child's eating habits, they wouldn't need any kind of supplement or so called health drinks. Consult with your dietitian to know more on how to encourage your child to eat healthy.